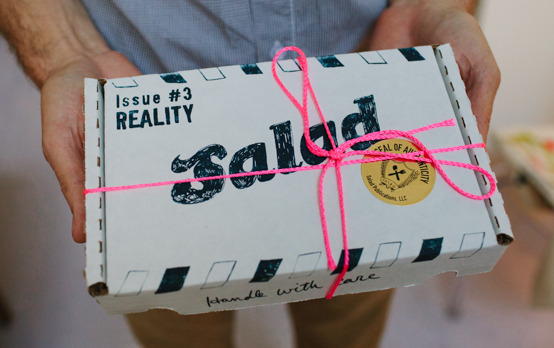 This issue is authentic, bonafide, and 100% real Salad Magazine. For the Reality issue we asked contributors to submit art and writing that questions or reflects upon the thin boundary between what we consider fake, forged, virtual, fantastical, illusionistic and real. Each issue is packaged in a screenprinted clam-shell cardboard box and contains five zines, a CD with digital projects, a glitch image screenprint and other related unbound ephemera. Additionally comes with both a gold seal of authenticity and certificate of authenticity signed by the editors. Featuring Jess Anderson, Kevin Benisvy, Tracey Bullington, James Canto, Rachel Deutsch, Coorain Devin, Stephen Duncombe, Packard Jennings, Steven Lambert, Tim McCool, Robin McNulty, Grace Myers, Simon Remiszewski, James Traggianese, Bradley Tsalyuk, Francsca Ulivi, Madeline Weisburg, Marina Weisburg, Ali White and Lauren Kimball-Brown.